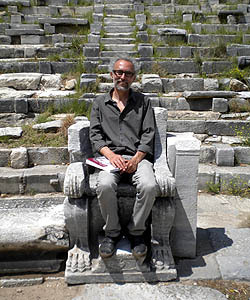 Alexander Mazarakis Ainian is Professor of Classical Archaeology with the University of Thessaly in Greece. He studied History of Art and Archaology at the Université Libre de Bruxelles", Belgium (1980-1983, degree conferred with “Grande Distinction”) and continued his postgraduate studies at University College London with a grant from the Alexander Onassis Benefit Foundation, obtaining his Ph.D. in 1987, under the supervision of Professor J.N. Coldstream. Since 2009 he has been the President of the Scientific Committee of the University of Thessaly Publications and a Member of the Board for the Management of the Assets of the University. He has been the Scientific Director of several major European Union Research Programs as well as personal research programs and several other scientific projects. He has directed the excavations at Skala Oropou in northern Attica (and Early Iron Age metalworking site), at the ancient capital of Kythnos (Archaic-Hellenistic sanctuary), at Soros in Thessaly (Late Archaic-Classical sanctuary of Apollo at ancient Amphanai or Pagasai). Professor Ainian's areas of specialization are the archaeology and architecture of Early Iron Age and Archaic Greece, and Homeric Archaeology, as well as ancient Greek religion and sanctuaries of the Geometric through the Classical periods. In recent years he has also specialized in underwater archaeology. Professor Ainian is a 2014/2015 Kress Lecturer for the AIA.